Singapore Airlines (SIA) has chosen Adelaide to debut its new two-class Airbus A350-900 configured for medium-haul operations. The first flight with the next-generation Airbus widebody is scheduled to take off on December 18 2018 and represents both an upgrade in terms of the passenger experience and an upgauge in capacity from the A330-300s SIA currently uses on its daily Adelaide-Singapore service. SIA’s A330-300s have 30 angled lie-flat seats in business class in a 2-2-2 layout and 255 seats in economy for a total of 285. By contrast, the new medium-haul configured A350-900s have 303 seats comprising 40 in business class in a 1-2-1 layout with direct aisle access for every passenger and 263 in economy class at nine-abreast. The difference represents a seven per cent increase in overall seat capacity. SIA regional vice president for South West Pacific Philip Goh said it was the right time to deploy the airline’s newest on-board products into what was a growing Adelaide market. 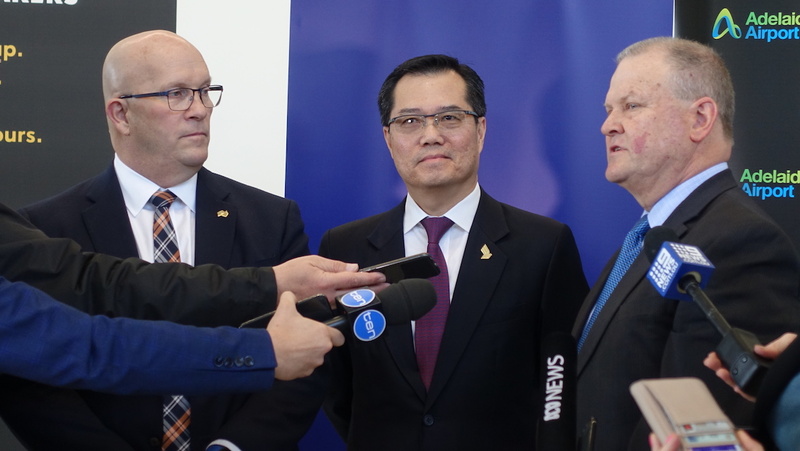 “We needed a lot of seats for this market, especially at the back,” Goh told Australian Aviation at the official announcement at Adelaide Airport on Thursday. Further, the use of the larger A350-900 to Adelaide would coincide with SIA’s efforts to promote South Australia throughout the airline’s global network to grow the number of inbound visitors. SIA is the only airline offering nonstop flights between Adelaide and Singapore. Adelaide Airport managing director Mark Young noted SIA was one of the airport’s longest-serving airlines having been flying to the city for close to 35 years and he looked forward to celebrating the arrival of the new aircraft in December. “We’re the fastest-growing international airport in the country and have been for a little while now. Today’s announcement by Singapore is just further recognition I think of the awareness that South Australia is gaining internationally of our wonderful product and it is a great vote of confidence of the future of the state,” Young said. South Australia Minister for Trade, Tourism and Investment David Ridgway said the use of the A350-900 to Adelaide would also boost the state’s trade links given the 20 tonnes of cargo capacity. “It means more chance to get our fresh produce back up into Asia and to Singapore, seafood and some of our perishable products,” Minister Ridgway said. SIA was expected to take delivery of its first medium-haul A350-900 shortly before the equipment change for Adelaide takes place in mid-December. Looking further ahead, SIA also announced Brisbane as the second Australian destination for the two-class A350-900. Currently, SIA flies four times daily between Brisbane and Singapore. Three rotations are operated with the airline’s three-class 253-seat A350-900s that are primarily used to serve long-haul markets and have 42 business, 24 premium economy and 187 economy seats. A 777-200 is used for the fourth daily flight. While the shift to medium-haul A350s to Brisbane would result in the loss of a premium economy offering from the Queensland capital, Goh said it would help meet market demand for more seats into and out of Brisbane. “In looking at the route and how it has developed, premium economy is growing well and up to expectations, but the missing part has been the economy cabin,” Goh said. “People are missing out on economy and we couldn’t carry as many passengers as we had in the past. Also, the aircraft change to the two-class A350-900 would allow those long-haul configured A350-900s to be deployed into other markets. SIA said the shift to the medium-haul A350-900 for Brisbane would take place in early 2019. No specific start date was given. The airline also operates long-haul configured A350-900s to Melbourne. Figures from the Bureau of Infrastructure, Transport and Regional Economics (BITRE) showed SIA has an average inbound load factor of 82.3 per cent and average outbound load factor of 81.4 per cent in calendar 2017, compared with 81.8 per cent inbound and 83.1 per cent outbound in the prior calendar year. The aviation powerhouse and Virgin Australia alliance partner is this country’s largest foreign carrier based on international passengers carried. In May, SIA restructured its operations to the Australian and New Zealand capitals by ending its Singapore-Canberra-Wellington flights and starting up four times weekly Singapore-Melbourne-Wellington and daily Singapore-Sydney-Canberra-Singapore services. The shift of the stopover point for its Wellington flights from Canberra to Melbourne, as well as a retiming of the service to offer better connections, has led to an improved performance on that route. Goh said the airline was now considering how to add capacity into Wellington either through more flights or with larger aircraft. 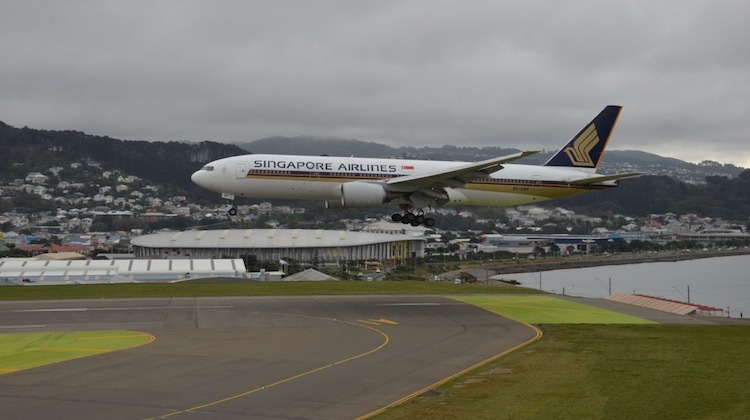 Goh noted Airbus in June brought one of its A350-900s to Wellington to test if the aircraft could potentially operate out of the airport’s runway, which at 2,081m in length is somewhat restrictive in terms of widebody operations. “The 777-200 is one of the older aircraft in the fleet. That aircraft is going to go away from the fleet, we are going to get rid of it,” Goh explained. 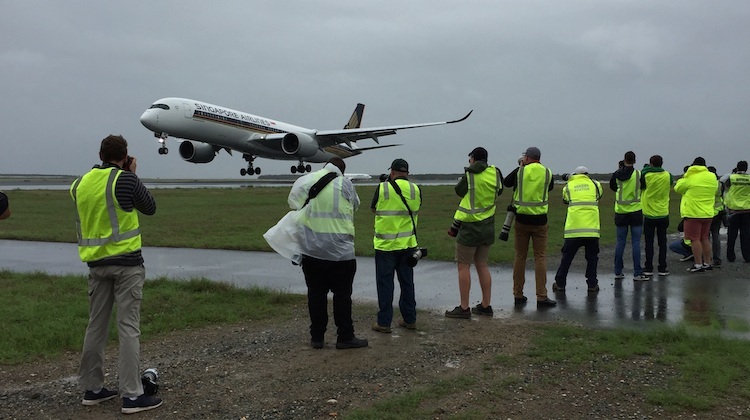 Wellington Airport chief executive Steve Sanderson said at the time the testing aimed to show the different combinations of loads and distance an A350 could reach off the runway. “It’s about determining the future performance for Wellington as more of these aircraft enter the fleet in the Asia-Pacific,” Sanderson said. On October 11 2018, SIA will reclaim the title of the world’s longest nonstop passenger flight when its Singapore-New York (Newark) service resumes after a five-year absence with the A350-900ULR (Ultra Long Range). The flight has again given SIA the ability to offer a host of cities in its network – as well as the network of SIA’s regional wing SilkAir – a one-stop option to New York that was lost in 2013 when the service was withdrawn due to high fuel prices and the difficult operating economics of the four-engined A340-500 previously used on the route. One of those cities is Perth, where travellers heading to New York can opt for convenient connections through Singapore Changi rather than two-stop itineraries via Australia’s east coast (or New Zealand) and the United States. Goh said the ramp up in interest out of Perth for the New York service, the proposed Singapore-Los Angeles offering and the existing Singapore-San Francisco nonstop flight, had been pleasing. “We are seeing an increased uptake from Perth,” Goh said. “Of course we left that service five years ago so now it is about building awareness and building the market back. A number of items are worth a comment here. The first, is that Singapore Airlines are adding more seats to ADL, yet our own airline Qantas, can’t even offer any international seats from ADL. The second, is that Singapore Airlines has for services to BNE. Qantas only has one a day between BNE and SIN. The third, is the high uptake of passengers from PER to New York via SIN. This conflicts with those who continually criticise Airlines for long haul non stop flights. It seems that passengers prefer them over stopovers and additional security screens that occur as a result. @David, SQ is able to offer these flights because it is flying from its hub where it has connecting traffic from all corners of the globe. Most of QF’s passengers are flying only to Singapore and not connecting onwards. Maybe QF can’t make ADL work for them. QF don’t just offer SIN out of BNE, they go elsewhere. Singapore Airlines goes predominantly to out of Australia, big shocker here, SINGAPORE!! Maybe QF has other revenue streams it finds are far more profitable. @Tony, the economy seats on SQ’s A350 are wider than their A330s. But yes, it will be more annoying for middle seat passengers to get through to the aisles. @Tony, while I see your point re: less passengers to disturb, I think the actual overall experience would be an improvement in Y or at least comparable to A330. While the seat width in Y is is one inch less in economy from the A330 to the A350 (according to seat guru) it still is 18 inches. Which is more than a lot of airlines offer in Y. Also the A350 offers a practically brand new aircraft, as apposed to an older generation aircraft in the A330. Seat pitch is also the same. For the relatively short 6-7 hour hop from ADL to SIN I would go for it if I lived in Adelaide. If I needed to get to Europe It would certainly be preferable to an ADL-PER 737 flight on QF. Followed by a gruelling ULH flight to London in a 787 with less seat width than the A350. Going via Singapore to LHR with an A350/A380 combination would be much more desirable prospect, with more space, on SQ. Which goes to the point that @David was making. Why can’t QF offer direct overseas flights from ADL? ADL seems to be growing internationally for other carriers, so why not the flag carrier? I suppose QF would argue that they have good domestic connections from ADL to other Australian gateway airports. They also have a one stop option to Europe through a transfer at PER. However as per my above point, this is a less desirable option than what SQ are offering. Also an ADL-SIN-LHR great circle distance is less than ADL-PER-LHR according to great circle mapper. The distance is marginal but is still less. When you look at this and the overall product offering, give me SQ any day over QF out of ADL. I agree.the only real advantage the ADL-PER-LHR QF option using the 737/787 combo has over anything with SQ is a better connection.but just over 3 hours to Perth,4 hours transit/customs/immigration and waiting around and just on 17 hours to London at 24 and a half hours based on summer schedules.the best SQ connections is just over 7 hours to Singapore 8 hours transit but you can get yourself a dayroom for some sleep for a six hour block or do a sightseeing trip from the airport(do not clear immigration) and just over 13 hours onto London.If I was to go again i know which 1 i would choose.coming home the other way the only advantage is being home the next day at night almost 17 hours down to perth,4 hours clearing your customs/immigration and rechecking in for the domestic flight home and almost three hours to adelaide SQ home has a shorter connection via Singapore and is 100% international so scheduling is on par. Singapore Airlines are simply fantastic! Their strategy for route development is and always was, as a leader of innovation. This works. Next step for Wellington ought to be the operation of the A350XWB on the more successful Melbourne/Singapore route. This wonderful aircraft is an absolute delight to fly in. The passenger response would help build the service to daily. Remember, that these awesome aircraft are replacing the 777-200/ER fleet, anyway. The Payload capability will be enhanced with this aircraft from WLG. Done. Yes please SQ!